Pictured: Pleasantry, a music group from Singapore. Photo: Marilyn Goh. There are times when a casual hobby becomes a full-fledged passion, like how borrowing a friend’s guitar to learn a few tunes turns into a daily ritual of writing songs for a weekly open-mic night at the local bar. It is in those magical instances when that passion — in this case, for creating music for a local scene — can often develop into a career choice. 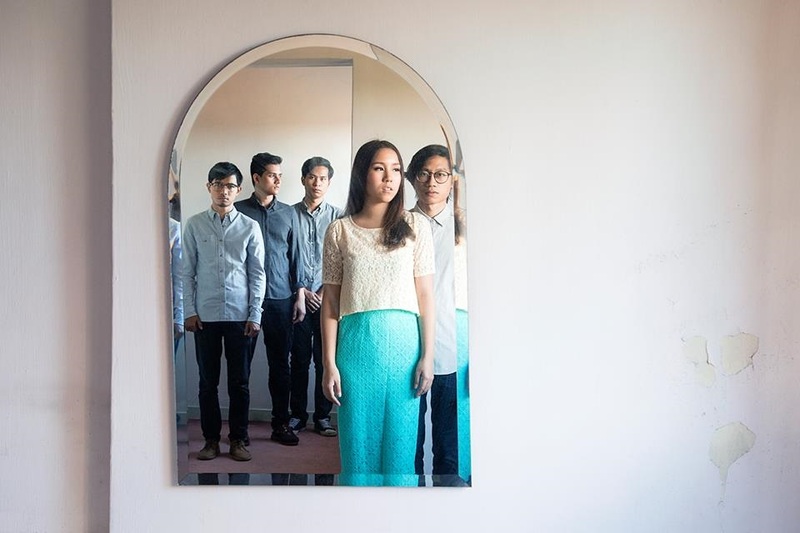 Pleasantry, a five-member indie rock band from Singapore, is a prime example of the latter. With an impressive archive of studio recordings (including two EPs and one LP) and an international tour to boot in just five years, their choice seems solid. But in a world where new bands form just as quickly as they cease to exist, they’re aware that apart from having to innovate with their sound, they must also have something they can always fall back on. This is precisely why Samantha Teng, Isa Ong, Ahmad Ariff, Daniaal Adam, and Haziq Hussain, who comprise the shoegaze group and have recently released their debut full-length album, Synapses, maintain separate and stable careers that include engineering, banking, and marketing. Of course, their current realist-minded lifestyle doesn’t prevent them from dreaming of selling millions of copies of their albums and playing sold-out world stages, but they consider themselves satisfied if they only end up making a difference in someone’s life with their music. “If we are able to make an impact on someone else’s life with our music, then we’ve achieved our goals. That’s what pushes us to keep going. Of course, we all harbor hopes to do this full-time, and [so] it’s great to see that we’re taking baby steps toward that at the moment,” drummer Daniaal Adam tells us. Relying heavily on each other’s personal experiences, the five friends create layered sounds that encapsulate the amalgamation of individual influences in and out of the studio. Adam took the time to talk to us about the band’s experiences, losing a band member, their latest album, and what it was like opening up for Belle & Sebastian in the U.S.
GALO: Apart from knowing each other for quite some time, you all grew up around the small-time, local music scene in Singapore. How did your local roots propel you to form Pleasantry and break new ground? Daniaal Adam: Being a part of a small music community has its advantages. We’re all pretty lucky that there’s a great sense of togetherness and massive support among fellow musicians. We all know each other, so it’s pretty easy to reach out to friends for collaborations or new ideas. That’s precisely how Pleasantry started out — five people, who were all playing for different bands, coming together to try something new. GALO: Each one of you has his or her own demanding career aside from Pleasantry. Samantha works in a bank; Haziq is an engineer; you work in PR and marketing; and both Isa and Ahmad have been working toward a degree. What has been most influential in keeping you all geared toward your work with Pleasantry? Have any of you thought about committing to Pleasantry full-time? DA: We love music. Every opportunity we get to come together, to write songs or perform, we look forward to [it] because it’s our escape and it’s how we like to express ourselves. If we are able to make an impact on someone else’s life with our music, then we’ve achieved our goals. That’s what pushes us to keep going. Of course, we all harbor hopes to do this full-time, and [so] it’s great to see that we’re taking baby steps toward that at the moment. GALO: Adel Rashid left Pleasantry to pursue an education in music business after two major releases in 2014. Was his decision well received by the band? And how were you able to keep a consistent sound throughout this transition — were you looking for someone to add something new to your music? DA: We didn’t want him to leave the band at that point in time, but we recognized what an important opportunity he had in front of him and we didn’t want [to] hold him back. It took us a while to get his replacement, and throughout the whole process of finding one, we decided we wanted someone who could give something extra vocally. Haziq was the perfect candidate for that. He also fronts for another Singaporean shoegaze band called ANECHOIS. GALO: In an interview with GigSlutz, you described yourselves as “an emotional sound-circus.” Can you elaborate on that? What emotional elements contribute to your image as a band? DA: The inspiration for our songs is in our everyday lives. Sometimes we have good moments and other times really bad ones. And we always make it a point to project those emotions in our songs. We’re also very inclined [toward] epic sounds, and you’ll hear that in most of our compositions, layers of different instrumentation playing together in the different spaces throughout a song. GALO: When describing Synapses, you state, “Our personal journeys impact the moments we remember and the recollections we make.” It definitely captures your theme of distorted realities and how individual perceptions impact memories of shared experiences. Can you explain that disconnect? What do you want listeners to take away from this album in terms of reliving moments and even lessons to learn for making memories in the future? DA: We all have our own individual journeys in life. When you’re in a group sharing an experience, sometimes you tend to overlook small things that might lead to a bad experience for someone else without even realizing it. The album is about empathy, tolerance, understanding and building better relationships. GALO: The album possesses distinct dreamlike qualities that are especially apparent in the opening song, “Channels.” It starts out with the sound of an old film reel and emerges with distant vocals about paving paths and weaving webs. What does this opener do for the album? DA: We like the idea of having soundtracks for little moments. We think it enhances the experience even more. The old film reel was deliberately added at the start for that exact same reason. GALO: “Nothing’s There” has grounding and heavier guitar riffs that contrast the surrounding delicate vocals heard on this song and the rest of the album. Was this the influence of one particular band member or was it the result of a collaboration? DA: Glad you pointed that out! Interestingly enough, “Nothing’s There” is the first song we wrote as a band [that involved] Haziq in the creative process. So, I guess, maybe that’s where the distinct influence comes in. GALO: All of your albums explore intimate themes about personal journeys, whether through overanalyzing in Porcelain Lenses, memories in Synapses or love in the Pleasantry and Starry Eyed Cadet Split EP. What life experiences do you draw from while creating albums specific to these kinds of personal themes? DA: For us, it’s more about the process of deconstructing and analyzing different situations and understanding them better. In the process, we remember the good memories and let go of the bad ones. GALO: As a band that enjoys playing intimate shows, opening up for Belle & Sebastian in February of this past year must have required some real adjustments to your performance. What did you learn about yourselves while playing for a crowd of 7,000 people? Was there anything you had to change about your performance to grab the attention of attendees during your international tour? DA: We had to amp up our energy levels, for sure! We’re not always afforded that much space on stage, but it was nice to be able to move around more. We usually play more of our emotionally charged songs in smaller, intimate spaces. But that time around, we played almost all [of] our high-tempo, happy and upbeat songs. We always tailor our set-list for different events. It’s always good to have a good balance of slow and more up-tempo songs. GALO: Do you hope to one day play for stadiums? GALO: Now that you have a recent international tour under your belt, what is the next big goal in your careers as musicians? DA: We’ve already started writing for our second album, which we hope to release sometime next year. In the meantime, we’d love to go on more tours — perhaps Australia next! If you’re interested in learning more about the band, their music or their current endeavors, you can visit their official Web site or follow them on Twitter @pleasantrymusic.